Photoshop Art brushes work a little differently to regular brushes. Used with a graphics tablet it can give a more natural feel for digital painters. In this tutorial I won’t be using a tablet but I will be using the different settings. As you can see we have a lot of control over how the brush behaves and I’ll be using this to make several different effects. With the young woman layer active I’ve added an Hide All layer mask . Now when I paint with white on the layer mask I’ll be revealing the young woman layer. I’ve got some interesting results from the Round Fan brush so that’s where I’ll start for this tutorial, and for the first go I’ll leave it at it’s default settings. 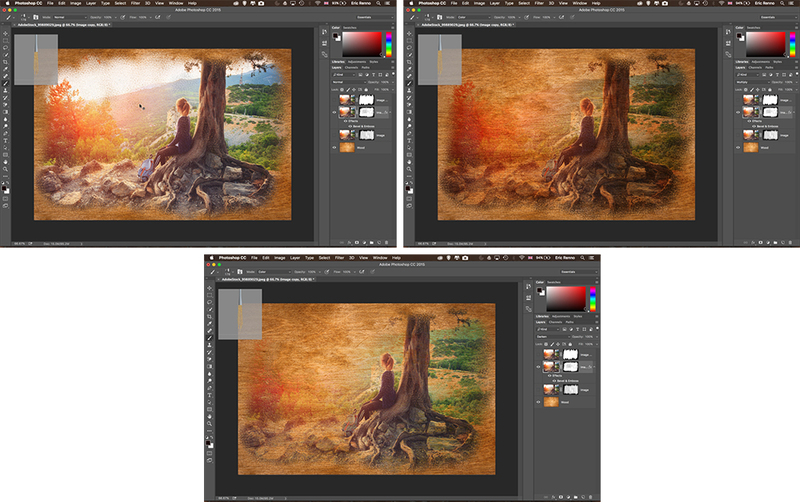 With a large brush size I’ll start at the bottom left with a single click, then holding Shift click at the top leftish. By pressing Shift the brush strokes in a straight line between the two points. By zig-zagging my way across the screen I can make some nice brush strokes. This is all well and good, but I want to experiment some more. With the woman image active I’ll press Ctrl+j (PC) / Cmd+j (Mac) then, with the layer mask selected press Ctrl+Backspace / Cmd+Backspace to fill it with black. Then I’ll turn the visibility of the first layer off. The variance in the brush it endless and I can quickly build up a series of different ‘looks’. Eric’s background in video editing with Adobe Premier led to his interest, and then obsession, with Photoshop. Starting TipSquirrel.com as a hobby he is proud to have gathered together and be a part of The Photoshop Nuts. Known as only “TipSquirrel” for two years, Eric ‘went public’ when he was a finalist in The Next Adobe Photoshop Evangelist competition. He’s also been a finalist in Deke’s Techniques Photoshop Challenge. While still taking on some freelance work, Eric has recently become a Lecturer at Peterborough’s Media and Journalism Centre where he enjoys sharing his knowledge as well as learning new skills. This realisation that he loves to teach has made Eric look at altering his career path.